Simple and elegant or ostentatiously decorated, with a large and powerful or slender, compact feel: all shoes in existence today originate from a few basic types. 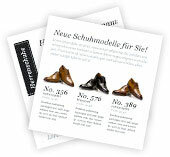 Most classic men’s shoe types were designed in various European fashion capitals during the 19th century. The impetus: the rise of the first fashion journals and a sort of competition among European shoemakers between 1880 and 1889. The shoe types created then have stood the test of time, although, in keeping with trends, they’ve undertaken slight modifications over the years. Classic types of men’s shoes include lace-up shoes (oxford, derby, blucher, budapester, men’s boots), buckled shoes (monk strap), and slip-on shoes (loafer, moccasin, boat shoe). When it comes to the manufacturing process behind these high-quality men’s shoes, top-grade leather is indispensible. Shoe history shows that shoe construction and production methods have hardly changed over the years: the craft remains steeped in tradition. Shoe care regimens and shoe-centric dress codes have also remained largely unchanged. In terms of their outward appearance, classic shoes offer aesthetes a real feast for the eyes. Meanwhile, their interiors boast high-quality materials that support healthy feet by ensuring an optimal shoe fit. 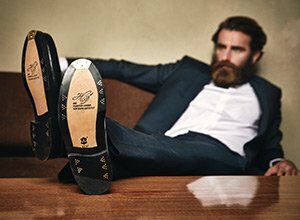 Classic types of men’s shoes don’t merely differ from one another in appearance, but also in closure and decoration. According to legend, the students of Oxford College popularized these shoes in the mid-19th century. Today they’re considered the most elegant type of men’s shoe. The great financial expert André Kostolányi was a devotee of derby shoes. He wasn’t alone. Legions of derby fans make this comfortable and elegant model one of Europe’s most beloved shoes. In addition to the derby, the blucher also features open lacing. The latter’s name refers back to a bygone Prussian field marshal; nowadays the blucher is a key component of the gentleman’s countryside wardrobe. The ur-dandy Beau Brummel made them famous in the 19th century. Ever since then it’s been impossible to imagine men’s fashion without men’s boots. They offer special protection against cold and damp weather as well as an extremely high degree of comfort. Although they’re probably known to most as traditional Native American footwear, moccasins are also an indispensable part of 21st-century men’s fashion. Moccasins impress with their high level of wearing comfort—so long as you don’t have too far to walk. For those who like to dress casually in their time off and who prize shoes that are easy to put on, there’s no better men’s shoe than the loafer. And who better to first catch on to the trend than students? Not only are boat shoes at home on the water; they’ve also been conquering dry land since the 1980s. Hardly surprising, given that these leisure shoes are extremely light and comfortable. The monk strap is a shoe for the unconventional man. Its buckle closure challenges conventions of conservative style—this remarkable shoe polarizes opinion. Named for its city of origin, this model is an old favourite among the shoemakers of Budapest. However, it’s not quite accurate to refer to the budapester as a men’s shoe model—it’s more like a special kind of last. Buckled shoes represent extravagance and individualism, and they definitely polarize opinion. The monk strap is a prime example of this type of shoe. Lace-up shoes enjoy extreme popularity: they’re the most common type of shoe. The best-known types of lace-up shoes are the oxford, the derby, and the blucher. Lightweight and easy to slip on, these shoes are a leisurewear favourite. The most common types of slip-on shoes are loafers, moccasins, and boat shoes.